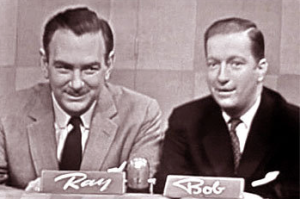 Ray Goulding, with his partner Bob Elliott (right), was half of the most durable broadcast comedy partnership in broadcast history. “Bob and Ray” got their start at WHDH-AM and became stars on national radio and TV. They were the first humorists to perfect a style that was fully based in broadcasting, with a full array of crazy characters – all played by either Bob or Ray. Their Bob and Ray distinctive brand of humor – satiric, offbeat, absurdist, fertile, and incredibly creative – lasted almost fifty years and inspired hundreds of others, from Bob Newhart’s one-sided telephone interviews to The Firesign Theatre to “The Worst Person in the World” later used by Keith Olbermann on MSNBC. Bob Elliott and Ray Goulding began as radio announcers (Elliott was a DJ, Goulding did the news) on WHDH-AM in the 1940’s. Each one would visit the other while on the air. Their informal banter was so appealing that WHDH would call on them, as a team, to fill in when Red Sox broadcasts were rained out. They would improvise comedy routines all afternoon (no night games back then), and joke around with studio musicians. They went to New York in 1951 when the show went national on the NBC, CBS, and Mutual Networks, including regular appearances on “The Today Show” with Dave Garroway, as well as WINS, WHN, hosting afternoon drive on WOR, later moving to NPR from 1976 to 1987. Webley Webster, mumble-mouthed book reviewer and organ player whose reviews of historical novels and cookbooks were dramatized as seafaring melodramas. Calvin Hoogavin, a character in one of Bob & Ray’s soap opera parodies. Farm Editor Dean Archer Amstead, whose low, slurring delivery was hard to understand and often punctuated by him expectorating into a spittoon. He also voiced all of the show’s female characters – including Mary McGoon, who drew her name from Mary Margaret McBride and Somerville’s Magoun Square and managed to blend barbed invective with inspired daffiness; Linda Lovely, Mary Backstayge, and Fanny Butcher, the female leads of Bob and Ray’s soap opera parodies; Natalie Attired, who specialized in speaking the lyrics to college fight songs accompanied only by a drummer. Ray Goulding was born in Lowell in 1923 and died in 1990.